There are few flooring types that can raise your home’s value and get you a better return on investment than wood. Hardwood floors have been used for centuries for their beauty and durability. Newer materials to the market, such as bamboo flooring, bring a similar beauty with the added benefit of being a more sustainable product. Bamboo is often sold and grouped with true hardwoods, but it’s actually a type of fast-growing grass of which there are more than 1000 species. Not all species are made into bamboo floors, however, and it is difficult to tell which type you may be purchasing. Hardwood flooring may be made of a solid piece of wood or it may be engineered with several layers of plywood 1 beneath a hardwood veneer 2. 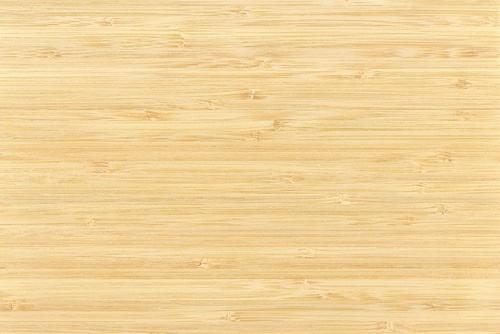 Bamboo is always used as a veneer 2 on top of a plywood 1 core. While bamboo flooring, as we know it today, is fairly new, it is actually one of the oldest materials known to man, giving it just as long - if not longer - a reputation as hardwood. Below, we’ll outline the basic differences between these two materials so you can make a more informed choice. There are different types of bamboo flooring just like there are different types of hardwood. Both are available in glue down and interlocking planks, while hardwood is also available in a nail down installation type. Interlocking planks of both types are fairly easy to install. The tongue and groove edges of the planks mean that anyone can install them, including DIY homeowners. Glue down and nail down installations are more difficult and both require professional installation to ensure that they are done well. Glue down floors for both bamboo and hardwood cost about the same, but a nail down hardwood floor will cost more to install than for bamboo. That said, the average cost to install hardwood is around $8.75 a square foot, while the cost to install bamboo is closer to $5. Both bamboo and hardwood come in several different styles, sizes, and species, which affect the final cost. The average cost of bamboo is around $5 to $6 a square foot for material and around $10 a square foot installed. Hardwood costs start around $3.50 a square foot but can be as high as $12.50 a square foot for material and $12 to $21 installed. This means that hardwood on average will cost 50%-200% more than bamboo, but some species and finishes cost less. This is because of the different installation methods. Prefinished solid hardwood flooring in an exotic species is going to cost more than unfinished domestic wood flooring because exotic hardwoods 3 often have transportation costs added in. Wider plank floors may also cost more, as can floors with specialty finishes, such as wire brushed. Most bamboo flooring sold in the US is Moso and doesn’t have as many variations, which is why costs may be more consistent. Wood species vary tremendously in terms of color and grain pattern, which means you can have a wide range of different looks for your hardwood floor. While bamboo also has many different species, you can generally only get a few different looks for your flooring. Traditional bamboo floors show the “knuckles” of the grass in the planks. Strand woven bamboo takes on an appearance more similar to that of traditional hardwoods with a simulated grain pattern. Both come in a wide range of stains and colors, although some types of bamboo are given a dark color by heating the planks to cause the sugars to soften, giving them a darker appearance. This also makes the planks softer and more prone to scratches. Both wood and bamboo can age in sunlight and humidity, darkening over time. 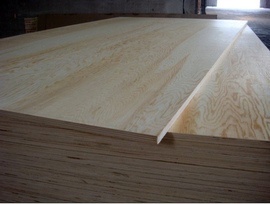 Some wood species are more prone to this than others, such as cherry and walnut, but nearly all woods and bamboos will be affected to some degree. Both wood and bamboo floors are affected by moisture and humidity levels. Strand woven bamboo and solid hardwood floors are both particularly susceptible to moisture and cannot be used below grade or in basements. Bamboo in general is slightly more resistant to both moisture and mold than hardwoods. Engineered hardwood floors can be used anywhere as they are built to withstand moisture and not swell on contact. 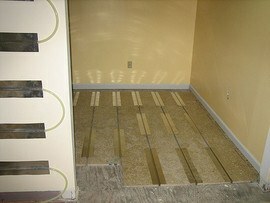 Engineered bamboo floors are the same and can also be used below grade. Traditional bamboo floors, however, will swell on contact with moisture and should not be used in damp areas such as kitchens, bathrooms, and basements. Both hardwood and bamboo have similar maintenance needs. Both should be damp mopped regularly or vacuumed without the use of a beater or bristle bar to prevent scratches. The biggest advantage of hardwood is that it can be sanded down and refinished more times than bamboo, particularly if the wood is solid. Solid hardwood can be refinished more than engineered hardwood. Bamboo can only be refinished once or twice before the veneer 2 wears through. Therefore, hardwood can last up to 100 years, while bamboo lasts roughly 25 - 35 years. Both hardwood and bamboo can be considered renewable and sustainable materials. 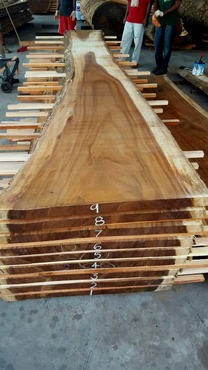 Hardwood takes longer to renew, however, with most trees taking up to 70 years to be harvestable. Bamboo can be harvested within 5 years, which makes it a more sustainable product in general. Both materials can be produced with low volatile organic compounds (VOCs) and free of formaldehyde to make them greener as well. 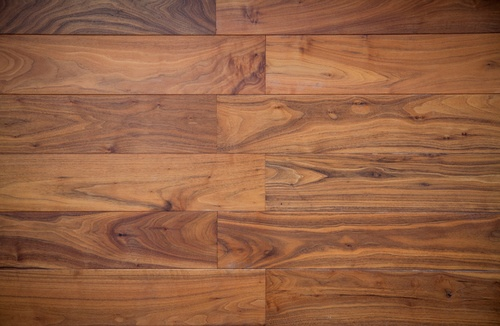 Hardwood flooring is much longer lasting and durable than bamboo. Traditional wood is much longer wearing and requires less maintenance. Real wood flooring can be refinished multiple times to restore it. Bamboo flooring cannot be refinished as often and depending on the type may scratch or dent more easily. Both bamboo and hardwood floors can be installed over radiant heating. However, the installation should be floating or made with an interlocking tongue and groove edge rather than a glue down or nail down installation. Moreover, it is not recommended to use radiant floor heating 4 under a plank wider than 3". All in all, as the constant temperature changes and builds up of condensation, the floor may be damaged quickly. To know more about the use of hardwood/bamboo flooring over radiant heating, it is recommended to consult the American Hardwood Information Center. How much does it cost to install bamboo or hardwood flooring in my city? Cost to install bamboo or hardwood flooring varies greatly by region (and even by zip code). To get free estimates from local contractors, please indicate yours. Timber from deciduous, flowering, seed-bearing trees that grow in tropical rainforests.